The forty days of Lent commemorate Jesus’ forty days in the desert. Some believe he spent those days alone and while it is true he may have been physically alone he was anything but spiritually alone not only did the Father follow his every step I believe he took all of us spiritually as well. I believe it was our lives that provided him the encouragement to take step after step. Perhaps at no other time in Jesus’ life was his faith more proven than it was Easter morning when the world witnessed at empty tomb! While Lent is a time to come to grips with our need for repentance and deepen our relationship with Jesus it is also an intense time to deepen our faith because it is only in faith does Jesus’ death and resurrection make any sense. The greatest tool in deepening our faith is encouragement, the encouragement we gain from reading the scriptures, the encouragement we gain from spending time with the Holy Spirit, and the encouragement we gain from each other. Lord, facing the uncertainty of our day takes a heavy toll on our faith. 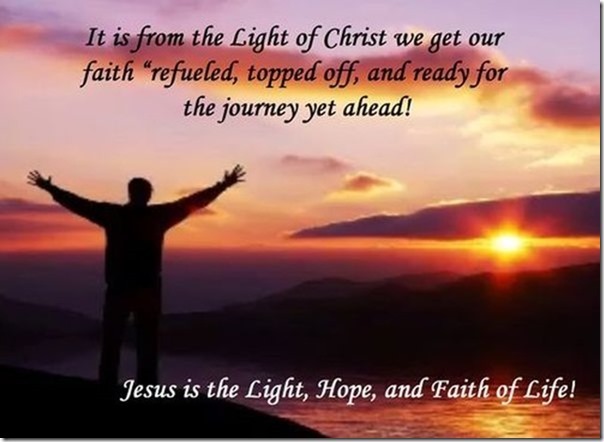 As we seek to replenish our faith come to us in the scriptures, empower the Holy Spirit to deepen and strengthen our faith, help us gain encourage from Jesus’ death, resurrection, and each other on our faith journey. Amen.